Upbeat Piano Studio now offers violin lessons, available as private, in-home lessons in East York, North Toronto and North York locations as well as at Leaside Presbyterian Church on Saturdays. The violin is perhaps one of the best-known instruments in classical music, but it has many other applications as well. Violin appears in nearly every musical genre, particularly jazz, rock and pop, and when played as its folk counterpart, the fiddle, it forms the basis of many types of world music. It is excellent for melodies and can produce a wide range of notes, making it an extremely versatile instrument. 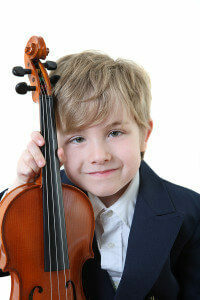 Violin is a popular choice for those new to the world of music lessons. Violin, along with many other types of music lessons, is much more than just a hobby. Numerous, long-rage studies have shown repeatedly that music lessons offer all manner of cognitive and social benefits, especially in children. The longer a student persists in making music, the greater the rewards. Creating music wires the brain to be more receptive to verbal and auditory input. This means that musical kids absorb new information better and have stronger recall than their non-musical peers. This can lead to great gains in a wide array of disciplines, including reading, math and science. Music lessons also help kids and adults improve social skills, such as communication and empathy. At Upbeat Piano Studio, we are passionate about building a lifelong love of music in all our students. Our staff of talented, professional music teachers places great value in making students comfortable with their lessons by meeting them just where they are in their musical journey, and by making their chosen instrument relevant to everyday life. We look forward to sharing the gift of music with you or your child. Upbeat Piano Studio is pleased to offer viola lessons. Private, in-home lessons are available in East York, North Toronto and North York. Lessons are also available at Leaside Presbyterian Church on Saturdays. The viola is often a natural transition for violin players, but it can be an excellent first instrument as well. It’s slightly larger than the violin and produces a deeper, mellow sound. The viola is used in both harmony and melody, and often appears in string quintets, folk, jazz and even pop music. Music lessons of all types offer inestimable benefits, particularly when started at an early age. The Journal of Neuroscience reports that creating music actually leads to structural changes in the brain. Children who take music lessons have been shown to have better memories and be better at self-regulating their behaviour than those who don’t have musical experience. 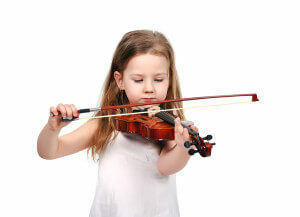 The cognitive improvements seen in children who play an instrument may even boost language acquisition and reading skills. Musical kids tend to have higher IQs and perform better on standardized tests. Playing an instrument such as the viola also improves fine motor skills, tasks that require hand-eye coordination and manual dexterity. The longer a student studies music, the more marked their academic advantages. Some gains are seen within just 15 months of starting music lessons, but we aim to help our students develop a life-long love of their chosen instrument. We encourage parental involvement and plenty of practice to help develop the discipline and perseverance for long-term commitment to an instrument. Perhaps the greatest gift a music student gains is a wonderful outlet for creativity and self-expression. We look forward to sharing the musical journey with you or your child. Our highly qualified staff delights in each new opportunity to share the gift of music with our students. Call today to learn more about our viola lessons!